As the old saying goes, nothing worth having comes easy, or without effort. That said, sometimes the effort itself is the reward. Such is the case with the 2013 BMW X5 M. Everything about this car requires effort. The steering is tight. Very tight. The accelerator pedal heavy. Very heavy. Even the turn signals require a definitive shove into action. But all this effort, is, in a way, effortless, as you’re so immersed in “driving” that you can’t help but grin from ear to ear. And that’s exactly what driving should do to your soul, no? 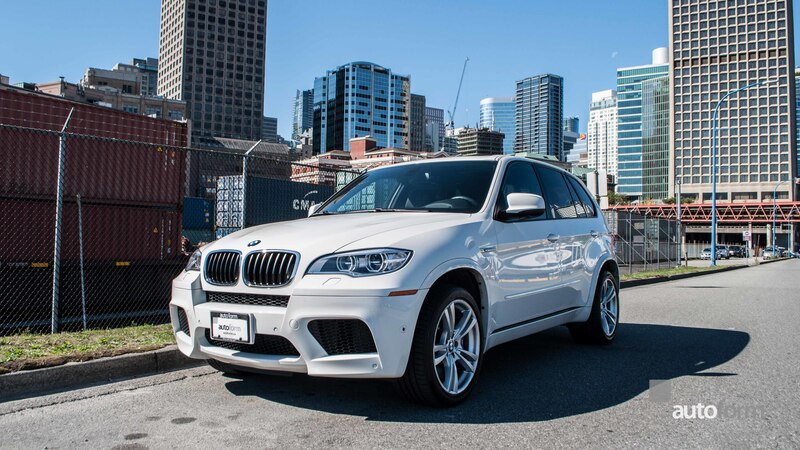 From the moment you get into the M powered X5, you know that this is serious business. The seats are snug, and offer what appears to be infinite adjustments, until you find just the right seating position for the only thing that matters: you. Push the start button and the 555hp V8 rumbles with a muted exhaust note that signals you to ponder what sort of visceral scream it’s going to unleash on those behind you when things get heated. Press the go pedal, and you instantly realize this truck is a machine to be reckoned with, one that doesn’t pull any punches and fights back, a bit. Really want to move in a hurry? The heavy accelerator pedal requires effort to spur the near 5400 lb beast into action, as if almost to ask, “are you sure?” Once you affirm that’s your intention and put your foot down hard, the engine spools its two massive turbos and catapults you into action like only a vehicle with 500 ft-lbs of torque at an exceptionally accessible 1500rpm can. It’s go time, and you’d better not just be hanging on. You need to tame this beast, give it direction, and tell it what to do. It listens. Intently. On twisty roads with your foot planted, suddenly the steering doesn’t feel heavy, but rather, the heaviness is supplanted by a different sensation: sweet, sweet feedback, letting you know exactly what’s going on, at all times. This is a driver’s car. Yes, car. Somehow, you don’t notice the SUV’s proportions when hurling through the air like a speedball ricocheting off Floyd Mayweather’s fists. Fully in control, you’re confident. Confident you can take any corner, at whatever speed you damn well feel like. The kind of confidence that comes from years of practice and perfection. That kind of confident. You’ve got this. Driven normally on a City street, the BMW’s 6 speed automatic nicely shifts into everyday life. Outward vision is unencumbered, seating position near perfect, and every switch close at hand, where one would expect. It has a luxurious interior with a fine attention to detail, including signature chrome beveled BMW M-Sport gages which give subtle hint of what lies beneath. Driven daily, the steering is a tad heavy, and that exhaust note reminds you that this SUV is just begging to be unleashed. This SUV isn’t for everyone. Soccer moms need not apply, although if Danica Patrick were to one day find herself ferrying children from one field to another we doubt she could find a better rocket ship to do it in.